Over a month after the initial outburst by Hawaii’s Kilauea volcano on the Big Island, fissures continue to spew fountains of lava up to 150 feet in the air, and the volcano has not shown signs of reduced seismic activity or eruptions following a turbulent six weeks. 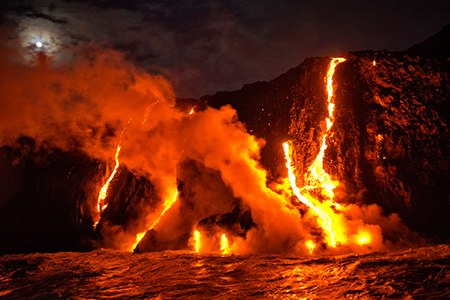 As the lava continues to flow into the ocean at Kapoho, an estimated 250 acres of new land have already been formed. Gas emissions and volcanic smog remain at dangerous levels, contributing to an already hazy atmosphere that can have serious health impacts, such as burning eyes, headaches, sore throat and coughing, especially for those in the vicinity of the ocean entry. The devastation continues for area residents. Officials estimate 700 homes have been destroyed since the lava began flowing. The destruction covered areas of the Leilani Estates neighborhood before destroying hundreds of homes in the Kapoho and Vacationland areas. “We all had friends and clients who lost homes, and several agents lost their homes,” Denise Nakanishi, REALTOR® and team leader of Team Nakanishi at Hawaii Life Real Estate Brokers, tells RISMedia. The key to moving past the devastation and turning compassion into action? Being proactive. And that’s exactly what Nakanishi and fellow community members have been able to do by answering numerous calls regarding rentals and temporary housing, and assisting displaced owners by replacing their homes. Nakanishi’s brokerage has placed affected residents in vacant vacation rentals for a reduced price or at no charge. And local associations are pitching in as well, having always played a significant role in providing housing and aid for those in need. What attracted these homeowners to this specific area of the island, knowing they would be living over an active volcano? Nakanishi says it’s difficult to put into words because the area offers an indescribable beauty. And while many have criticized the act of building on such temperamental land, Nakanishi reminds them that there’s risk anywhere you go. Areas in California were devastated by wildfires this past year, and hurricanes ravaged multiple states last season. Many homes in the area do not have insurance. But for those that do, Nakanishi says that obtaining video and photo proof of the home and any damage sustained is essential to getting timely answers from the insurance companies. Is the end in sight? According to the U.S. Geological Survey, the flow is still active and they don’t know when the eruption will end or if more lava vents will open. Hawaiian Volcano Observatory (HVO) officials say the 1955 eruption of the lower east rift zone lasted about three months, while the Kapoho eruption in 1960 only lasted five weeks. Regardless of how long lasting the current activity is, the real estate industry and the Hawaiian community will continue to pull together and help those who have been impacted by the lava flows. “Team Nakanishi, Hawaii Life and Hawaii Island REALTORS® are fully involved in assisting, donating and loving all that have been affected by this,” says Nakanishi. For those who would like to support the 1,700 Hawaii Island residents impacted by the lava flows, the Hawai’i Life Charitable Fund is accepting donations, and will match the first $20,000 in contributions received.